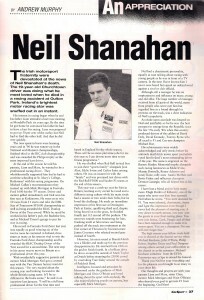 The Irish Motorsport fraternity were devastated at the news of Neil Shanahan’s death. The 19-year-old Churchtown driver was doing what he most loved when he died in a racing accident at Oulton Park. Ireland’s brightest motor racing star was snuffed out in an instant. His interest in racing began when he and his father Liam attended a kart race meeting at Mondello Park six years ago. By the time he got home he convinced his father he had to have a kart for racing. Liam was prepared to put up 50 percent of the outlay but neil had to find the other half. And that he did very quickly. The time spent in karts were learning years and in ’96 he was runner-up in the National and Munster championships; finished third in the IKC club championship and was awarded the Philips trophy as the most improved kart driver. At the end of the season he told his parents, Liam and Mary, he wanted to be a professional racing driver. They wholeheartedly supported him but he had to combine schooling at St. Mary’s College, Rathmines’ with his racing programme. On Michael Cullen’s recommendation they teamed up with Mick Merrigan in Formula Ford 1600 for the ’97 season. Driver and mentor gelled immediately and Neil won his first face at Kirkistown. He went on to win 10 races out of 11 starts and take the DHL Star of Tomorrow FF1600 championship as well as being awarded the RIAC Dunlop Driver of the Year award. While he raced he worked in his father’s pub, the Bachelor Inn, and at Michael Tynan’s garage to pay his way in racing. His record in Formula Ford Zetec last year was equally as good as winning six of the twelve races he contested in Ireland, three times as many as his nearest rival to win the Formula Ford Zetec championship and be awarded the RIAC Dunlop Driver of the Year award for a second time. The next step in his career was to move to Britain as a professional driver this year. He was thrilled when Red Bull invited him to join their “sports family” alongside Jean Alesi, Eddie Irvine and Carlos Sainz among others. He was an instant hit with the “family” and was promised test drives with the Red Bull F3000 and Sauber F1 teams at the end of the season. This year was a catch-up year for him in Britain, learning every circuit he raced and a different racing culture while his main rivals had a season or two under their belts, but he loved the challenge. He made an immediate impression at his first race at Donington Park at Easter, qualifying third and, despite being forced onto the grass, he finished fourth just 0.2 second off the podium. The next two rounds were frustrating for him, finishing ninth at Silverstone and being pushed off the track into retirement at the first corner at Thruxton by his team-mate James Courtney who selected second gear instead of fourth. However, his next round at Brands Hatch was a blinder and made up for the previous disappointments. He stormed from 10th on the grid to finish fourth. In a brilliant drive he drove around the outside of Mark Taylor at Druids before stunning the 25000 crowd by overtaking Tom Sisley around the outside of Paddock Bend. Intelligent, focused and articulate he blossomed under the guidance of Mick Merrigan and Oisin O’Briain and loved talking about the sport with anybody. He also enjoyed playing pranks on anyone, but especially Mick Merrigan. Neil had a charismatic personality, equally at ease talking about racing with young people as he was in front of a TV camera. In the time I have known him I never once heard him speak an unkind word against a rival or club official. Although still a teenager he was an inspiration to and influence on many, young and old alike. The huge number of messages received from all parts of the world, many from people who never met him but regarded him as a friend through his prowess on the track, was a clear indication of Neil’s popularity. Accolade upon accolade was heaped on Neil and justifiably so for he was the best prospect to emerge from the Republic since the late ’70s-early ’80s when this country produced drivers of the calibre of Derek Daly, David Kennedy, Tommy Byrne who all raced in F1 and Can-am champion Michael Roe. His achievements were widely acknowledged and only weeks before his untimely death Irish motor sport journalists voted him Ireland’s most outstanding driver of the year. His name is engraved on the Barney Manley Memorial Trophy alongside such racing luminaries as Eddie Irvine, Martin Donnelly, Kenny Acheson and Jonny kane, rally stars Austin McHale and Bertie Fisher, and rallycross champion Dermot Carnegie, who helped him in his career. The high esteem young fellow rivals held you in showed at the funeral service when Michael Keohane, John O’Hara, Philip Kehoe, Stephen Drury and Peter Dempsey among others carried your coffin either at the church or at the cemetery. Michael Keohane withdrew from the EFDA Euroseries race at Spa to attend the funeral. Thank you Neil for your friendship and for the pleasure you brought to so many in your short life. Our thoughts and prayers are with your parents Liam and Mary, sister Clare, mentor Mick Merrigan and Oisin O’Briain who shared your goal to get into F1 from the beginning. God Bless!